The above video is a short version that dose not include the math. The following link is to a loner version that contains the math warning if you watch that we are not responsible for imageries to your brain resulting from excessive math content. Measurements of the distance to moon made using retro-reflectors left on the moon by Apollo astronauts has shown the moon is receding from the Earth at 3.82 cm per year. Measurements using atomic clocks have shown that an day is Earth are getting longer at a rate of 1.7 milliseconds per day per century. Now it turn out that these two phenomenons are related to each other by way of the tidal forces between the Earth and the Moon. It has been know for decades that when these figures are plugged into the laws of physics that they show that the Earth moon system can not be more than about1.25 billion years old. Such calculations are largely dismissed by those claiming that the Earth is 4.5 billion years old. They also point to paleontological data as evidence that the moon is receding and it is receding at a rate compatible with 4.5 billion years. 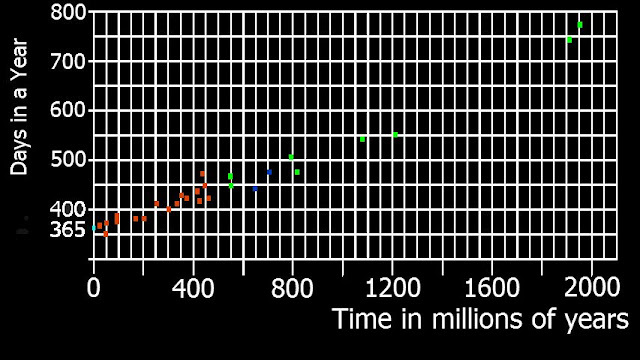 These claims not only ignore alternative interpretations of the fossils and rocks in question but they usually use only one or two data points when multiple data point are used the scattering in the data is not what would be expected if it were really a result of the slowing of the Earth rotation. Furthermore when the same paleontological data is plugged into the same laws of physics it produces a maximum age for the Earth-moon system of about 2.067 billion years. 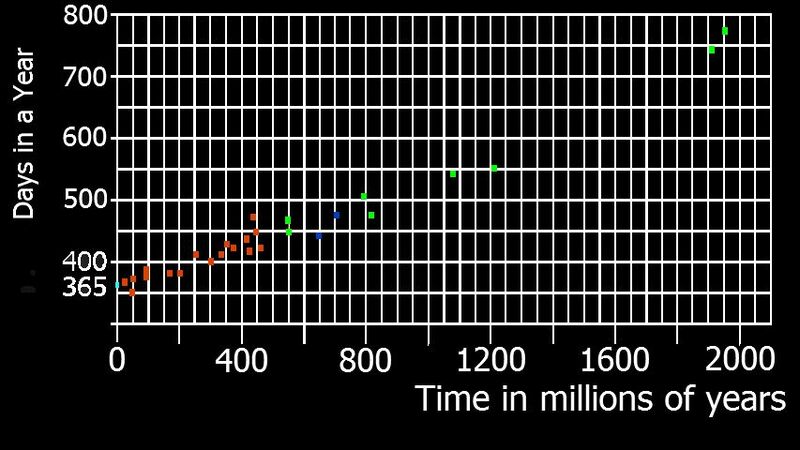 Tweaking this model to make it reach 4.5 billion years requires putting an impossibly small delay time in high tide of less than 24 seconds. There is simply no way of reconciling a 4.5 billion year old Earth-moon system with the laws of physics and the paleontological data claimed as evidence for the same. They simply do not and can not be made to match up. All of this makes a very strong case that earth-moon system can not be 4.5 billion years old. You can try the Lunar Recession Simulator us in this study for free online by following the link in the sentence. You can also buy a down loadable off line version this Lunar Recession Simulator that comes with the source code. In both cases it will show you much about tides, lunar recession and the slowing of the Earth’s rotation. It will help demonstrate why the results present here are valid.